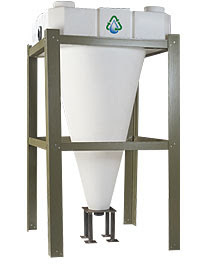 Fluidized bed filters are rapidly becoming the primary source of biological filtration in many modern aquaculture systems, replacing the less efficient trickle filters now in service. While trickle filters and fluidized beds both rely upon the same species of bacteria for ammonia and nitrite removal, it's how the two filters operate that sets them apart. It's very helpful to remember that in biological filtration, it's actually the bacteria that do the work; the filter itself only provides a suitable "home" for the bacteria to colonize. Trickle filters can best be described as open containers filled with various forms of solid media. As water enters the top of the filter, it drains down through this media in a random, cascading fashion. Since the media is stationary, it relies upon the changing water currents to keep the bacterial surface area moist. Fluidized bed filters, on the other hand, are flooded cylinders or tanks, partially filled with a granular media, such as white quartz. Water upflows through this media bed, causing it to expand and fluidize. The large number of bacteria that colonize this expanded media serve to remove the nutrients that are present in the flowing water. What results is a highly efficient filter bed that is no longer solidly packed, but is in dynamic motion. It is this combination that is the key to our QuikSand Filter's success.